The main entryway of your home is considered the mouth of your home in Feng Shui. Your front door is where new energy comes in, and it is one of the three most important spaces in the art of Feng Shui. 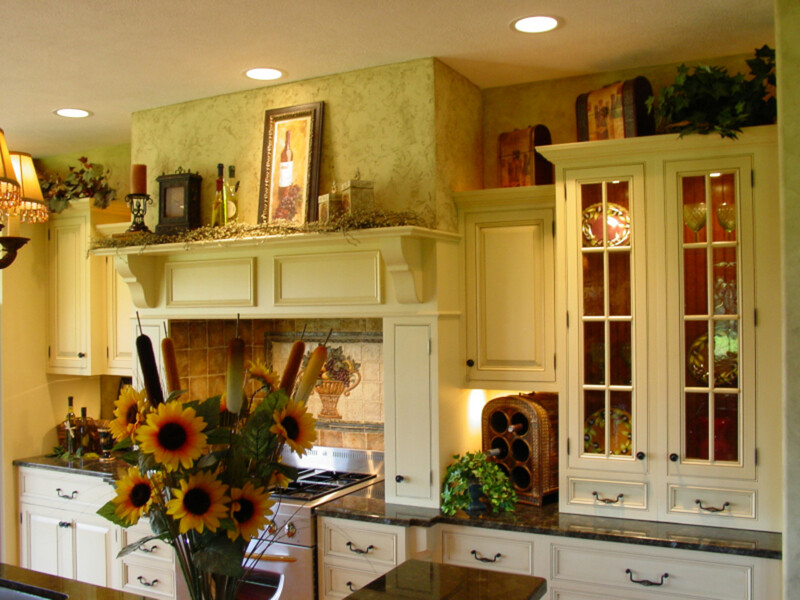 Your kitchen, bedroom, and front door are all very important to your wealth, health, and well being. Your front door is the center stage when it comes to the abundance, or lack, of new chi (energy) coming into your home. 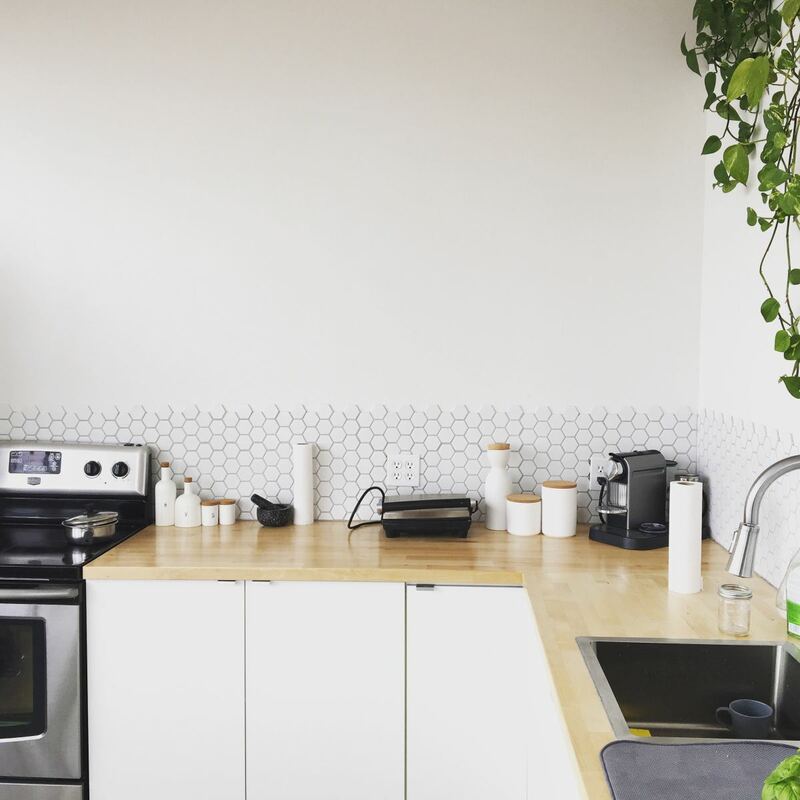 Any Feng Shui work that you've done throughout your home will not be nearly as helpful if your flow of new chi at your door is stagnant or non-existent. Go outside and look at your front door from the street. Is there anything that is hiding it like an overgrown bush? Is your door off to the side and hard for people to see? Is the path to your front door neat and clean? Look at it as if you are just seeing it for the first time. Does it look welcoming to you? If it doesn't look inviting to you, then it doesn't look inviting for good chi to come in either. If guests have a hard time finding your door then so will chi. If chi can't find your door then it will just pass your home and not bring in any new energy. Keep your front door well lit. Trim any bushes that are obstructing your entrance. Paint your door a color that pleases you. Red is usually what is suggested but that isn't always the best for everyone. When it comes to painting your front door, it is best to research or consult with a Feng Shui practitioner to find out what color resonates with the people who live there and the direction that your door faces. Put planters outside of your front door with lavish flowers or plants growing. Hang wind chimes to call in the chi. Keep the front of your door clean and polish the metal regularly. If the door is placed off to the side and hidden, then light a path to it. Making sure that it is easy to see from the street. 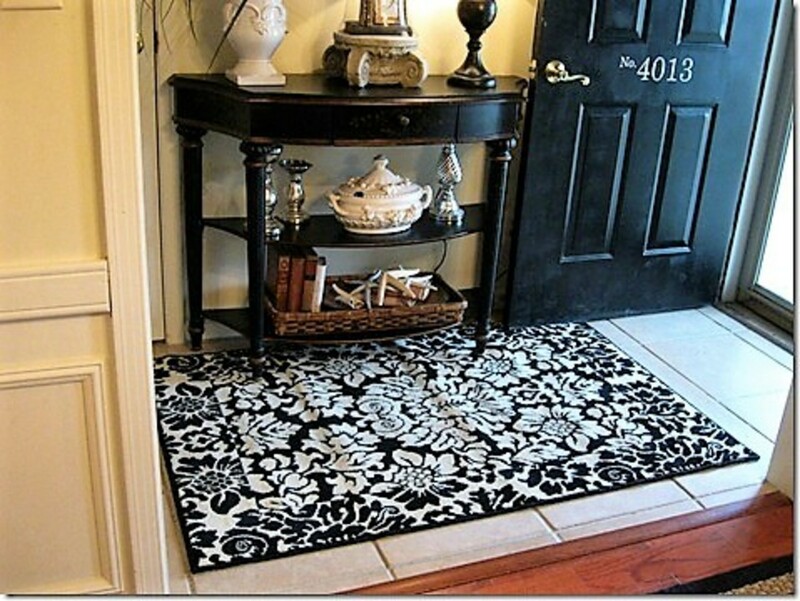 Place a colorful door mat in front of your door. Write a note and keep it under the mat that says "All of life comes to me now and brings my home abundance, joy, health and peace." Hang a seasonal wreath on your door that to welcome in each season. Look for arrows around your door. In Feng Shui, sharp angles are called piercing heart sha chi. So angular lines like a slanted roof over your door will cut and redirect the chi. Soften them up with something hanging like a plant. Remember that your front door is your calling card. It is the first impression that you give visitors about who you are. 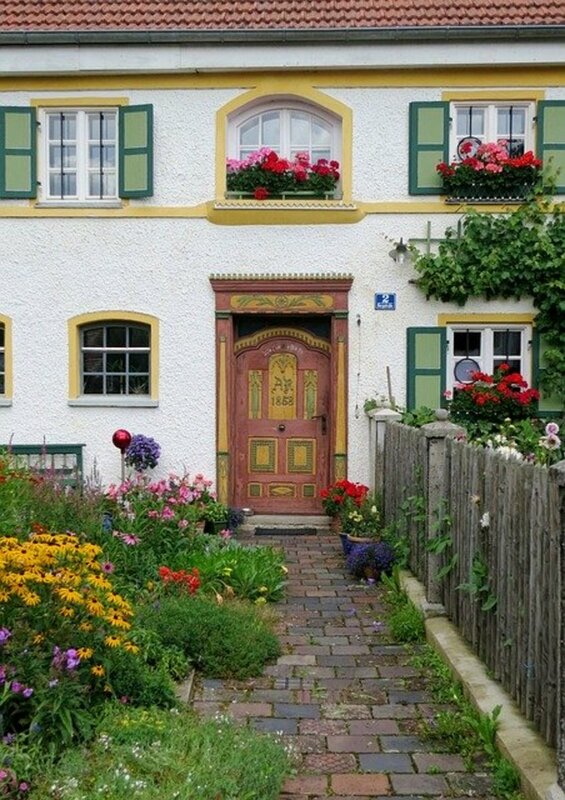 If you are looking at your entrance from the street, is it a house that looks inviting and cheerful? New chi flows the strongest when all of the elements are represented. Earth, Fire, Metal, Water, Wood. Walk through your door and pay attention to how you feel, what you see, and what you smell when you first walk in. Do you see a lot of clutter like coats and shoes? Is it dark and gloomy making you feel heavy? Do you smell pets or cigarette smoke? Unfortunately, we tend to not notice things in our home when we live with them for a long time. Looking at your entryway with the eyes of a new visitor can give you a wake up call. Chi will sit stagnant in any clutter and will not make it far through the door if the entryway is dark and gloomy. Clear any clutter and that includes what might be behind your door when you open it. Have no obstructions from the door having it's full swing. Keep the inside of your door clean. Polish the metal and dust on top of the frame. Look for heart piercing sha that is obstructing the chi flow. Soften them up with greenery or fabric. If you can see your back door directly from your front door then chi will come in and rush out quickly. Place some furniture to visually block it or if that isn't possible, then hanging a crystal or wind chimes between the doors works great. Burn incense or candles frequently at your entrance. If you don't want to place anything flammable there then a diffuser is an excellent choice. Accessorizing your front entryway might change as your needs and life changes. Depending on what it is that you are wanting to work on, you can use placement, elements and color to enhance that aspiration of your life. When using a western bagua map, your front door is the career sector of your home. Your career is what brings in the money that allows you the comforts of life. It is also your path in life. Using colors and accessories that relate to your career sector will enhance the career part of your life. The Career direction on the bagua map is south. The career color is black and the element is water.The shape is wavy and free flowing. Setting up a water fountain near the entrance will enhance the natural flow of the water energy. Make sure that the water is flowing into the house and not out. 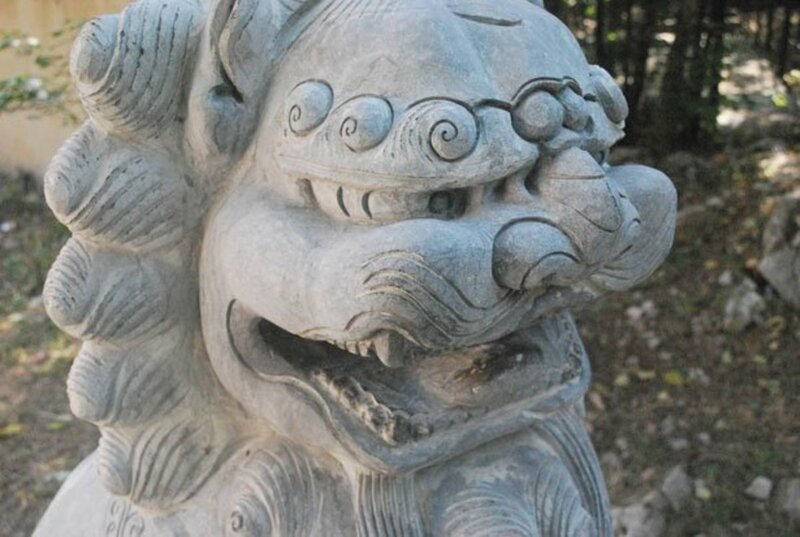 The Chinese Career Turtles are a favorite accessory to place either in artwork or statues. Success sayings or things that make you feel successful. A rug placed in front of your door that has mostly black with a swirling pattern will accentuate both the color and the movement of water. Display your work awards and achievements. If prosperity is on your list, then your front door is one of the 3 best areas to enhance that intention. The biggest key here is to keep that energy flowing freely. In and out like our breath. It is important to have money flowing in both directions always leaving us with more than enough for our wants and needs. The bagua map shows the prosperity sector of the house to be the far left which is the northwest area. The color is purple and the element is wood. The shape is tall and long. Red is also a very strong color for prosperity and is used in Chinese symbolism for prosperity along with gold. A water fountain near is a symbol of prosperity flowing in. Make sure that the water is flowing into the house and not out. The Money Toad is a good Chinese symbol to have at your front door. Have him facing away from the front door during the day and put him to rest at night by turning him so that he is facing a wall. Use purple flowers and artwork near the door. A rug in front of the door with a rectangle or long lined patterns. A rug with a tree pattern would be ideal. Symbolism that makes you feel prosperous. A money tree or frame your coin collection. Hang a red or purple wreath or greenery with gold accents on the door or above it. When we activate our fame aspiration, we are telling the universe that we are looking for recognition for the things that we have done. There is certainly nothing selfish about wanting a little fame with our accomplishments. Maybe being well known is how you make your money like a politician or a writer. What we want to be well known for is what we do best and if that happens to be how we make our living then combining it with your entryways natural career and prosperity energy will be powerful. Fame and Reputation is the north sector of the bagua map.The direct opposite of your front door. The color is red and the element is Fire. The shape for fire is the triangle. Display your accomplishments or symbols of recognition. The Chinese fame symbol is the Fame Dragon. Use a rug with triangle patterns with oranges and reds. Hang some candle holders on either side of the door or place them on a table near the door. Put a night light or some sort of decorative lamp near the door. The Bagua Luo Mirror is supposed to be placed outside above your door. It soaks up negative energy and allows positive chi to flow into your home. Do not place this inside of your home. You should still have a mirror on the wall next to the door on the inside of the entrance but adding the Bagua mirror outside will filter the incoming energy so that only positive energy is coming through your door. It is important to research how to use this mirror but you will love the Feng Shui benefits that you receive from it. Are you wanting to bring in a new love to your life or create a meaningful partnership with someone? If a stronger relationship in your life is what needs to be attended to, then there are ways to invite in positive partnership energy using your front door. The Relationship sector on the bagua map is the northeast area of your home. The color is pink and the element is Earth. The shape of Earth is square. Place pictures of the two of you near the front entryway. The love birds are the Chinese symbol of love. Use a rug that has square patterns with tones of lighter reds to pinks. Put pink flowers in a pottery vase. Place pretty rocks or stones in a bowl on a table near by. Do you make your living being creative in some way? Then activating that aspiration along with the natural career aspiration of the front door can be dynamic for both inspiration and and your career. If you want to have children or if children are your focus in some way then enhancing your entryway with the elements of the Creativity and Children sector would be the best way to get results. The Creativity and Children sector is located in the east on the bagua map. The color is white and the element is metal. The shape is round. Hang pictures of famous artists work. Display your personal art or something that you created. Use white flowers in door wreaths and greenery above the door. In Chinese symbolism, metal is a sign of wealth so any metal Chinese symbol is an asset. The metal Career Turtles would be a nice choice. Hang picture of your children or if you are wanting children, artwork with children. Use mother and child or family accents. A metal statue representing a mother and child in some way would be a smart way to bring in both metal and symbolism. Good examples would be, a mother elephant and her baby Or a dog and her pups. For both aspirations, a round rug would be perfect with a grey background. The butterfly is often used to enhance the Creativity and Children Aspirations. Are you wanting to buy that vacation beach house or cabin in the woods? Do you travel for your career or want a career that involves travel? You have aspirations but you are in need of the right people to help get you to your destination. The Travel and Helpful People sector is in the southeast direction on the bagua map. The color is grey and the element is metal. The shape is round. Hang artwork of maps or compasses. A Chinese symbol for travel is the traveling Buddha. Place a metal globe on a small entry table. Artwork of people helping each other. Artwork or accessories of spiritual helpers. Whom ever you look to for help. Angels, Buddha, the Universe. For both aspirations, use a round rug with grey accents or a rug with a circle pattern. Putting a diffuser near your front door gives hours of pleasing aroma for you to walk into. Use the different scents to create the presence of the elements and aspirations that you are creating. Using a diffuser instead of incense or a candle will give you a nice aromatherapy for hours with out having to worry about having anything flammable by the door. I've tried several different kinds of diffusers but this brand has the longevity that I look for. They have so many excellent aroma therapy scents to choose from. Use their Teak scent to bring in the element of wood. Lavender scent for peaceful sleep and meditation. Enhancing the health aspiration helps with more than just physical health. It also helps with the emotional and spiritual health of those who dwell within. This is one of the aspirations that should always be present in your entryway. The Health sector is right in the middle of the bagua map. The color is yellow and the element is Earth. The shape is square. Bright yellow fresh or silk flowers are always a good way to symbolize health. The Chinese wu lu is the symbol of longevity and health. Use a rug that has a square pattern with yellow accents. Add in some crystal accents. Citrine would be the perfect crystal to use. Has your family started to grow apart? Enhancing the family aspiration using your entryway will make your family members keep in touch and visit more often. If your focus is to have a closer interaction with your family then adding just a few items will help that along. Family is in the west direction on the bagua map. The color is green and the element is wood. The shape is rectangular. Hang or place pictures of family members next to or close to each other. Use accessories that symbolizes a family unit. Artwork of a gaggle of geese flying is a good example. A green rug with straight lines or rectangle patterns, The family tree patterned rug is the perfect pattern to use. Are you studying or learning something new and need that extra boost to help you concentrate and retain what you're learning? Activating your knowledge aspiration in your entryway will be a strong extension to your natural knowledge sector. The Knowledge sector is located in the southwest on the bagua map. The color is blue or teal and the element is earth. The shape is square. Place a book case near the door. Artwork of libraries or schools and museums. The rug can be square or have square patterns with a blue or teal accent color. Owls are a symbolism for wisdom and knowledge. When you are switching out your accessories to enhance the aspirations that you are working on, there a few items that should always be left in place. These three things are your Feng Shui entryway staples. A mirror hung near your front door but not reflecting your front door. A mirror hung on a wall near your front door activates the flow of the water element. A crystal hanging from the ceiling. A crystal will slow down the chi so that it doesn't go rushing through. It helps to balance the chi and disperse it in all directions. Bells or Chinese coins hanging from your door knob. Bells are used to ward off negative energy and bring harmony and good luck to homes and businesses. Bells create a balance and harmony to the environment. Coins should be hung on the outside door knob symbolizing money coming in. If you have to place them on the inside then make sure that the side that has 4 figures is facing into the room. You can also use coins inside if you place a prosperity bell opposite them on the outside doorknob. Oh thank you so much for reading!. I'm so glad that you enjoyed it. 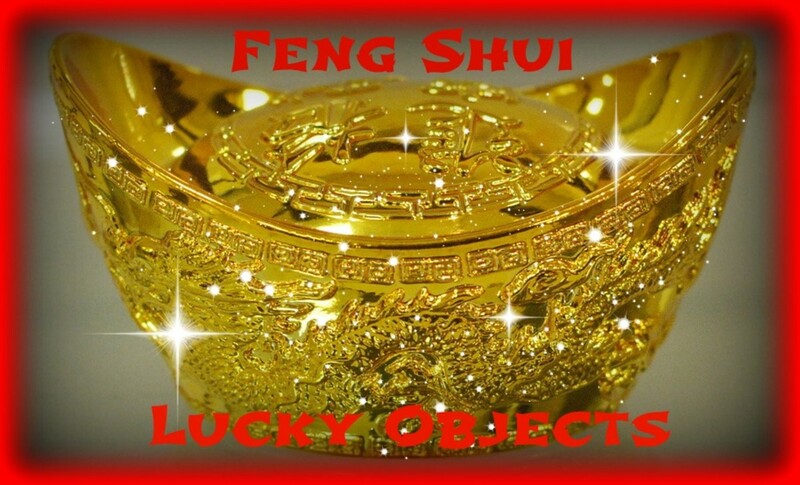 Thanks for the introduction to Feng Shui and the decorative skills and meanings which are part of it. Very interesting!